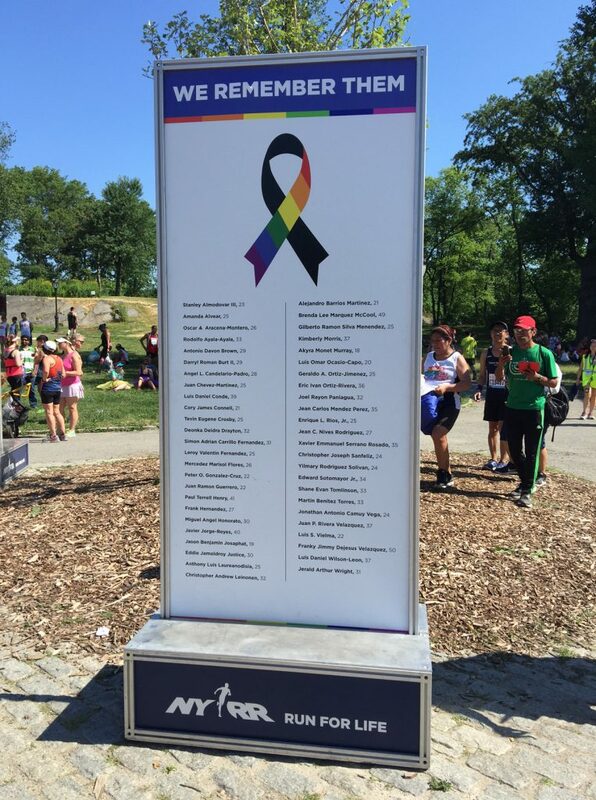 This past Saturday on June 25th, I completed the Front Runners New York LGBT Pride Run (5M). This was in collaboration with Front Runners New York (FRNY), an organization for the LGBT community and compassionate allies to support each other through running and other athletic activities. The race wasn’t easy but I finished strong. Unlike the Retro 4-Miler, this one was brutal. I committed to maintaining a steady pace but the temptation to walk kicked in for a bit. Fighting that urge was the biggest battle. Other than that, it was a great morning. Central Park was vibrant with energy. I admire every single person, whether they were runners, volunteers, NYRR staff and supporters, who came out and filled the atmosphere with love. Here are five of my reflections from race day. During the race, one of the volunteers, who was cheering all the runners, said something on the lines of, “Run for those who suffered because they were denied love!” At the time, I was crying on the inside because two open blisters were irritating me and my legs were sore. However, this volunteer’s cheer put things into perspective and made me realize that if the LGBT community suffered to be accepted for who they are and love, then I can gather my guts and deal with these cowardly blisters. This race started out as something I did for myself to see if I can deal with five miles of brutality but quickly turned into a way to honor everyone who has been treated inhumanely for who they are. Every runner who crossed the finish line that day made a statement to the world that they will absolutely not tolerate such acts of hatred. By training, I’m a 5K competitor. Running the first three miles is familiar territory. As soon as I saw the end of the three-mile mark, my body mentally attached huge weights to each of my legs. I really struggled to move forward during the fourth mile. When my mind kept telling my body to walk for a bit, I had a flash back memory of when my coach screamed, “No walking!” in her distinct and fierce voice during one of the first races I ran for SUA. Since then, I determined that, no matter what, I won’t ever walk during a race. If it comes down to exhaustion and the brink of defeat, I should still be jogging and never let weakness win. The brutality of mile four reminded me of just how hard I need to be working to get comfortable with more and more miles. Ultimately, this is the best form of practice leading up the big 26.2 mile run of the year. One of the biggest struggles leading up to this race was overcoming the disappointment in myself for not consistently running. I ran actively throughout college (4-year student athlete, hey!) but somehow lost the motivation to continue until now. The mind can be devilishly evil sometimes and attack my thoughts with regret and anger. I kept thinking that if I continued running after college, I would be in much better shape and have the ability to run faster. Someone asked why this bothers me and I guess my answer to that is stubbornness. It didn’t take long for me to realize that the more time I spent regretting my choices and feeling angry, the harder it was to complete solid workouts. From today onward, I will respect myself for choosing to start running again and make sure that every workout accomplishes what I need to in order to reach my big goal. Since I’ve established that I’m stubborn, I carry that attitude when it comes to training. I try to push hard and surpass the limitations I place on myself. However, I also learned that I’m not young like I was during my college days. Well, I certainly am still “young” in the bigger realm of things but as a woman in her late-twenties, it’s important to really take care of myself, especially for the long-term. I’ve accepted that I need to take a couple rest days here and there. Going easy with some workouts is actually necessary to recuperate. I also went on some runs where I forgot to foam roll my calves out for three days straight and couldn’t finish because they hurt too much. Finally, I need to show respect to my body and sleep like a responsible human being. Not taking care of myself can hurt my performance, both physically and spiritually, so I learned that it’s important to prioritize that. This run was all about runners coming together to support the endeavor of love. New Yorker runners are some of the most incredible and empathetic human beings and it truly felt like a honor to run alongside over five thousand people with five thousand stories. 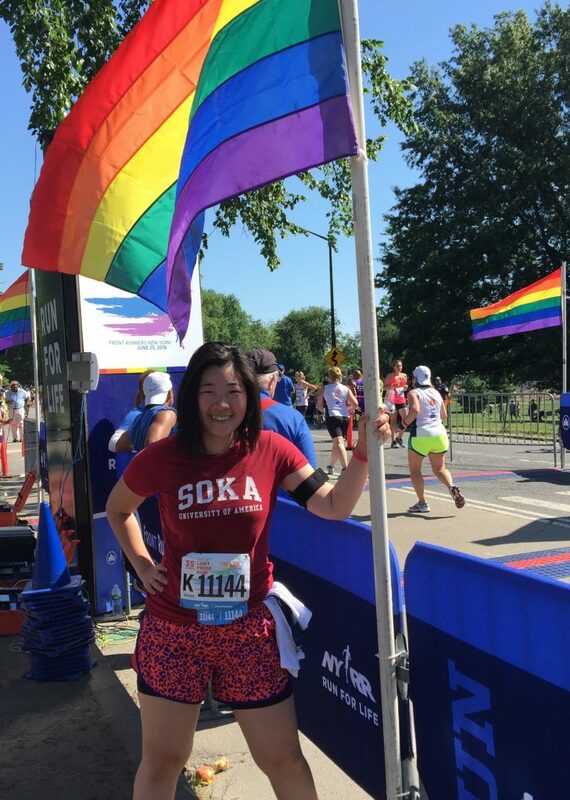 Whether the runners were directly from the LGBT community or not, I could tell that every single participant shouldered a struggle that he or she determined to overcome. Running together on that gorgeous Saturday morning surrounded by colorful outfits was our way of showing support and empathy. It is so hard to believe that when FRNY was founded 35 years ago, LGBT and LGBT-friendly runners didn’t even have the luxury of feeling safe as an athlete. I’m glad that on Saturday, every runner’s vibrant spirit contributed to the loving atmosphere. This is one race I want to continue running for as long as it exists. I showed this picture to a teammate who commented on my jaguar-print shorts. He asked if I got them to run fast and I told him that they helped me spring the last 200 meters. His response? “That’s how you finish a race.” Classic. The last race I ran was a four miler so I thought for sure that my mile time would be slower since this one was longer. Surprisingly, I shed off twenty seconds from my best mile time! Can you believe that? My next race in three weeks is a four-miler so I’m extra determined to make sure that I train hard and shed off more time. Oh, and guess what arrived in the mail? I got a formal letter congratulating me for joining the NYRR and I finally have my membership card. 9+1 status: 2 down, 7 left.